Harrogate Loft Conversions | Looking to Convert Your Loft? Having a loft conversion in Harrogate can be a great way to make better use of the space in your home. The popularity of loft conversions is - pardon the pun - going through the roof! The additional room literally transforms your home, and probably more crucially, adds significant value to your Harrogate property. This option is where the existing loft space is of insufficient size for the proposed conversion. It creates additional headroom for the staircase and new room or rooms contemplated. 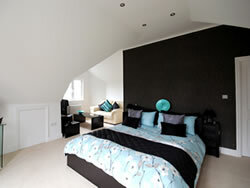 This is the most popular type of loft conversion in Harrogate, as well as the most feasible. This option is generally adequate for those contemplating the smaller loft conversion, generally for a single bedroom or study where adequate height is available within the existing loft space. Roof lights can then be installed with a minimum of disruption. Harrogate loft conversions should always include some form of natural light from above. Mansard loft conversion is generally designed for properties within the centre of Harrogate, where clients are following the Mansard trend of similar conversions within their area. This type of conversion was the preferred design a number of years ago, and would most likely be the preferred option from a planning perspective in sensitive areas. Loft Conversion Planning Restrictions Lifted! A recent law introduced in October 2008 removed many of the restrictions in planning extensions and loft conversions. This law allows many homes to now get loft conversions where they might have previously been forbidden. Many factors influence the building work involved in a loft conversion. I & C Watts are happy to provide a free consultation anywhere across Harrogate and the surrounding areas to give you an idea of how viable a loft conversion would be for your house. If you need space for a study, another bedroom or any other facility you have in mind, a loft conversion may be the answer. Contact us if you want to find out what type of loft conversion is possible in your home and how much it might cost for a Loft Conversion in Harrogate.